I'm not very good at punctuation or grammar in general. Anyone who has read my blog for any period of time has probably figured this out. It's a shortcoming that I'd like to correct, but am not particularly motivated to try to fix. Perhaps I should. At any rate, despite my utter dislike of rules relating in any way, shape or form to grammar, I thought I'd give this book a try. After all, "everyone has read it." I thought this book was utterly delightful and entertaining. Whether I learned anything or not is beside the point. Of course, I realize that was the point - oh well. Ms. Truss' sense of humor (dry and British) spills out on every page. She makes it sound cool to fixate on punctuation errors - glaring and otherwise. (By the way, I would prefer if commenters to this post did not try to pick apart my use of commas, etc. I am well aware that I have a long way to go in this area.) She even inspired me to want to use the semicolon - correctly! I'm working on it. After reading this book, I am very anxious to get my hands on a copy of Truss' other book, Talk to the Hand: The Utter Bloody Rudeness of the World Today, or Six Good Reasons to Stay Home and Bolt the Door. It sounds like something I would like. 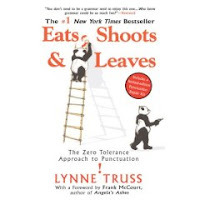 I would encourage anyone who loves punctuation or who wishes they did to pick up a copy of Eats, Shoots & Leaves. I can't imagine that you would regret it. Oh, you HAVE to read Talk to the Hand. I laughed my way through it. It's hysterical. I think I read it in just a couple of hours because I couldn't put it down. I read this last year and loved it - very clever and hilarious. Rarely does British punctuation differ from American, but when it does, of course she writes using the British style. I didn't know she wrote other books, so thank you for this post! I just went online and reserved her other works. Yes, it's on "my list" to read as well. I'm glad you enjoyed it. I am not one to criticize punctuation, because I think I have a thing with dashes and parenthesis, and I'm not sure I always use them correctly. However, I was an English major, and I do read your blog regularly and bad punctuation has not ever glared at me. I loved it too! I have Talk to the Hand on my wish list and I hope I get my hands on it soon.